Fabrique Nationale (FN) in Belgium and Lyttleton Engineering in South Africa were both licensed manufactures of the UZI and both produced their own magazines. Magazines can be found either with just the licensed manufacturer tool mark, or with both the licensed manufacturer and IMI tool marks. Construction: Heavy gauge metal, no seam in back, flush seam in front. 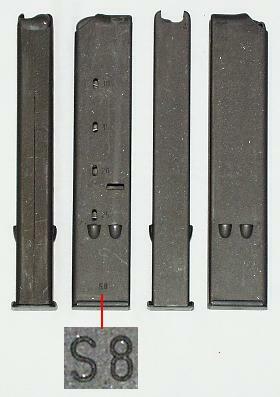 Comments: These mags fit fine in guns but can sometimes be very snug in some magazine loaders. Tool Marks: "S1", "S2"..."S8" on lower side, "IMI" on lower rear. Comments: Same as the standard South African Magazines but with the commercial "IMI" stamp added.